The theme of the conference focussed on the broad research and application of Gestalt theory in all sorts of social fields. Based on an idea of man that prioritises the social relatedness of the individual and explicitly includes epistemological and ethical aspects, and in particular in the face of new social challenges, the conference featured research results and current action plans in such fields as education, psychology and psychotherapy, the social sciences, cultural studies etc. 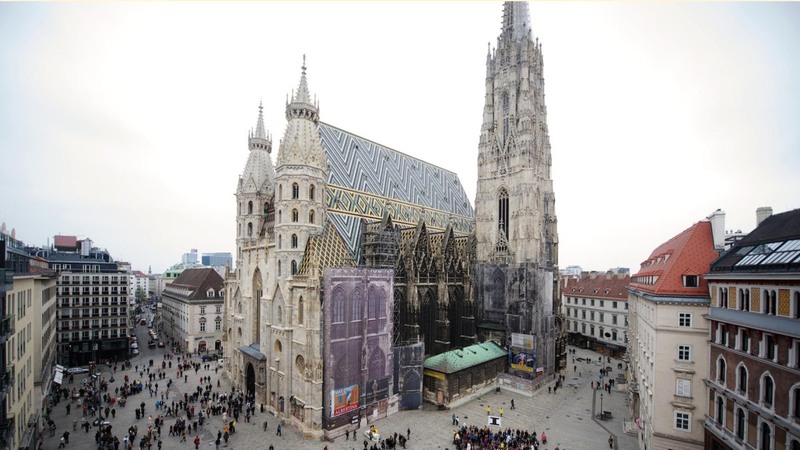 In its longstandig tradition the conference also provided a forum for discussing other current topics from the various different fields of research within Gestalt theory. The languages of the conference were English and German. Gestalt theory is known for its holistic and context-related perspective. 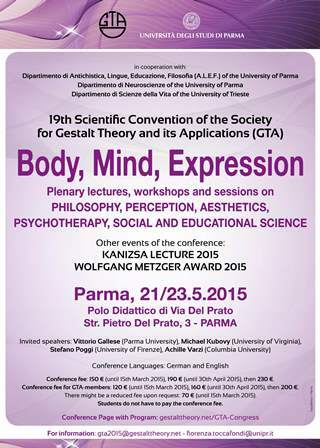 The interactions between body, mind and expression provide concise examples and will be the focus of this conference. 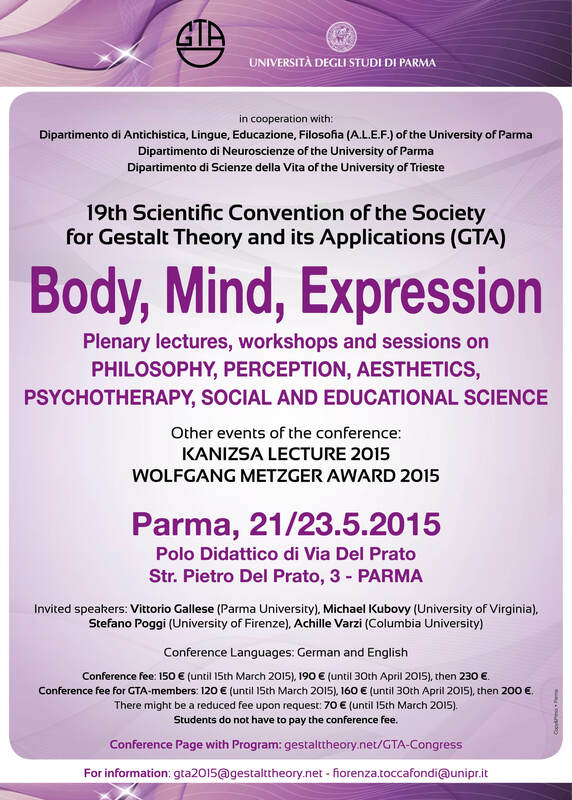 the Dipartimento di Scienze della Vita (Life Sciences Department) of the University of Trieste. The conference featured plenary lectures, workshops and poster sessions amongst others. Graduates were invited to shortly present their work in a special forum „Gestalt in progress“ (grants were available). For all participants interested an accompanying open discussion forum „sharing the conference“ has been organized. The languages of the conference were English and German. Students did not have to pay the conference fee but were asked to register. Program Committee:Fiorenza Toccafondi (Parma; president of the committee); Tiziano Agostini (Trieste), Anna Arfelli Galli (Macerata), Ivana Bianchi (Macerata), Silvia Bonacchi (Warschau), Jagna Brudzinska (Köln), Nicola Bruno (Parma), Serena Cattaruzza (Trieste), Beatrice Centi (Parma), Herbert Fitzek (Berlin), Thomas Fuchs (Bonn), Giuseppe Galli (Macerata), Walter Gerbino (Trieste), Thomas Heill-Zusanek (Wien), Riccardo Luccio (Trieste), Hellmuth Metz-Goeckel (Dortmund), Marianne Soff (Karlsruhe), Gerhard Stemberger (Berlin-Wien), Elena Trombini (Bologna), Rosamaria Valdevit (München), Giorgio Vallortigara (Trento).